Containing a mix of real insects, these treats will give your garden birds a hearty meal in the winter months when natural food is scarce. Extremely nutritious, they’re packed with energy, protein, vitamins and minerals which also makes them ideal for feeding during the breeding season. Perfect for bird tables and softbills, such as thrushes, blackbirds and robins, absolutely love them scattered on the ground, too! 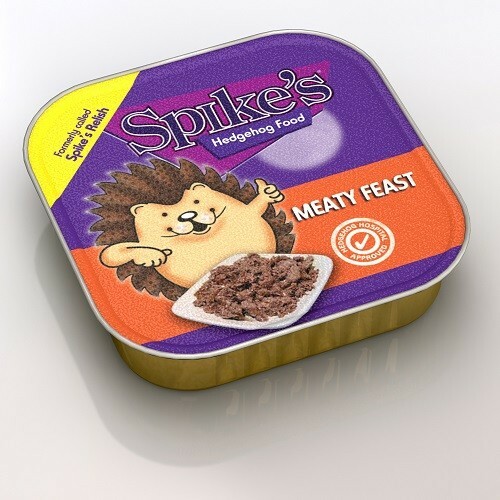 A moist and meaty hedgehog feast that can be fed on its own or combined with our Hedgehog Food or the Spike’s Delicious Crunchy Dry Food. Leave in a quiet corner in your garden with a shallow dish of water. Great tasting hypoallergenic snacks that can be used as a training aid, or simply as a reward for being a Good Dog! Ingredients Maize, chicken meal, white rice, potato, refined chicken fat, beet pulp, brewers yeast, salmon oil, micro-FOS, yucca. Great tasting hypoallergenic snacks that can be used as a training aid, or simply as a reward for being a Good Dog! Maize, chicken meal, white rice, potato, refined chicken fat, beet pulp, brewers yeast, salmon oil, micro-FOS, yucca. For the ultimate high-energy softbill food, look no further than no-mess Ultiva Softbill Mix. Thrushes, robins and blackbirds will wolf down every scrap of this nutritious feast containing sunflower seed hearts, peanut nibs, flaked maize, rolled naked oats, raisins and now a good helping of Bogena, the super-rich softbill food blended with insects, oils, fats and minerals. Best fed on the ground. It’s the ultimate food for feeders! We’ve taken our proven Feeder Mix and replaced the black sunflower seed with sunflower seed hearts. Now you can have all the benefits of Feeder Mix – free-flowing, non-blocking – plus the DOUBLE bonus of higher energy for your garden birds and no messy husks to clear up for you! The ultimate straight food, combining the highest energy content available with total versatility and ease of feeding. And because there are no husks, they leave no mess to clear up! The perfect berry mix for your garden birds! Wild berries are an important source of protein and energy, especially as the weather turns cold. With a dash of aniseed this aromatic mix will prove irresistible to your garden birds. Loved by Thrushes and Waxwings, this mix can be used in a feeder, on tables or scattered on the ground. 1. Bacteria Clean Disinfectant – £4.99 At last, a disinfectant designed specifically for wild bird feeders and accessories. Our Bactericidal Cleaning Disinfectant simply sprays on, rinses off. Fully biodegradable, it kills all viruses and bacteria, including salmonella, and contains no harmful phenols. Ideal for feeders, tables, nest boxes, water bowls and all wild bird feeding accessories, it helps eliminate the danger of cross-infection. 500ml in a trigger-action bottle 2. Feeder Fresh – £9.99. This formula ensures your feeders are kept clean which in turn ensures healthier birds. The non-toxic granules absorb the water to keep the surrounding bird seed dry and mould-free. The biologically inert formulation will not harm birds or natural water supplies. 3. Onyx Seed Feeder – £31.95 It’s important to keep your feeders clean throughout the year but it can sometimes be quite a fiddly task. This fantastic new feeder make cleaning easy – just turn and click to remove the base allowing access to clean all the nooks and crannies that are otherwise tricky to reach – it’s brilliantly simple! Of course, you can also benefit from the sturdy desgin and attractive looks of all Droll Yankees feeders. Not only does the design incorporate the click-to-clean base, it is also high capacity, extra comfort perches and the Droll Yankees lifetime guarantee. Medium size 1.6 litres. You’ve heard of bird boxes – why not install a bat box? The narrow construction of this box means it’s suitable for a wide range of bats while the fixed roof keeps drafts to a minimum. It’s this time of year you should be thinking about putting bird boxes up. It gives the birds the chance to explore them in winter before moving in during the spring. Whilst these camera nest boxes aren’t cheap they will enable you to watch the birds progress as they make a nest, lay eggs and the eggs hatch. It’ll be amazing. Ice Free For Bird Baths prevents water freezing in temperatures as low as -4 ºC. This eco-friendly product is formulated from plant extracts to suppress the freezing point of water in bird baths and other small garden water features, and is completely harmless for birds to drink and bathe in. Simple to use, completely safe and totally effective, it could be a real lifesaver this winter! 250ml in bottle with integral dosage chamber. You can hang it with the chains supplied, mount it on the ground with the supplied spike, or fit it onto the Meripac 2-feeder pole! Made from strong plastic, this versatile bird bath is 14″ in diameter with a textured and ridged surface for safety. This ceramic bird bath is frost resistant and the elegant design will look great in any garden. Standing height of 77cm, 67cm above ground level. The special shape of Birdbath RaftTM transforms any garden pot, barrel or pond into the perfect bird bath, providing a sure foothold and the perfect depth of water. Durable, easy to clean and great value! Winter draws closer so feeding the birds starts to be a priority! A seriously nutty treat that’s rich in protein and packed with energy. We use only the finest quality peanuts (with nil detectable aflatoxin) and suet to provide a premium quality treat which is second to none. Ideal for use in winter, they will give an instant energy boost to hungry birds. This ceramic, contemporary designed feeder is frost resistant. It comes supplied with a cord for hanging and is versatile enough to feed many different types of food including Ultiva Seed Mixes, live foods and suet pellets.